Heat from Busselton’s ground water is being used to warm indoor and outdoor swimming pools at the Geographe Leisure Centre reducing power costs and saving 447 tonnes of greenhouse gas emissions annually. The innovative project was designed by Busselton Water, in partnership with the City of Busselton, with funding from the Commonwealth Government. It was awarded the Infrastructure Innovation category in the prestigious 2014 WA Water Industry Awards. The system heats the swimming pools and manages air handling at the leisure centre by extracting heat from groundwater stored at Busselton Water’s Treatment Plant 2, on Queen Elizabeth Avenue. Water from the storage tank is pumped through an exchange system to extract heat from the naturally warm ground water and the water is returned to the storage tank ready for distribution to customers. 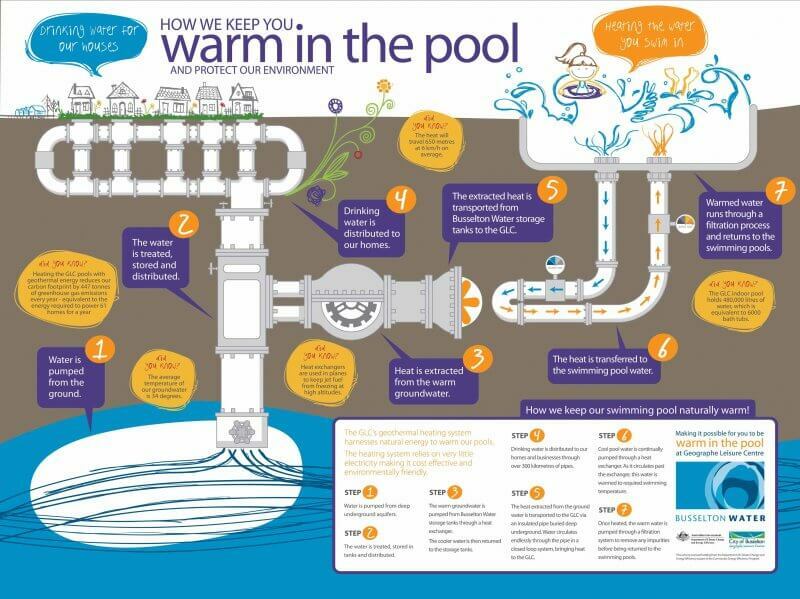 Water is pumped from the leisure centre and warmed before being returned to heat the pools. The system has made the outdoor swimming pool available to recreational swimmers all year round and delivered significant reductions in energy costs and benefits for the environment.